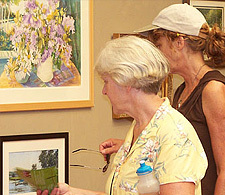 Opened in 1921 as a permanent exhibition home for the Lyme Art Colony artists, the Lyme Art Association Gallery, which is free to the public, continues to be a vibrant art center. Professional as well as developing artists mount major exhibitions throughout the year and form the heart of the Lyme Art Association which now boasts over 1,000 members. With a busy schedule of exhibitions and sales, affordable art classes, workshops, and a popular lecture series, the Lyme Art Association welcomes you on your next visit to Old Lyme CT where art lives!